While raising larval cultures in my embryology class I observed development of the polychaete Sabellaria cementarium which has a trochophore larva. The trochophore is an early developmental stage of marine animals such as annelids and mollusks. 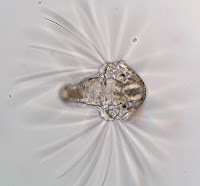 Trochophore larvae have a transverse ciliary band that assists in locomotion, sensory reception, and sometimes feeding. This ciliary band is called the prototroch. It separates the episphere, anterior region, from the hyposphere, posterior region. The mouth is located very close to the prototroch (on the downstream side). So that a current created by beating cilia on the prototroch brings food particles to the mouth. The Sabellaria cementarium trochophore larvae have two large bundles of setae on the trunk. These setae are barbed and are longer than the larva itself. 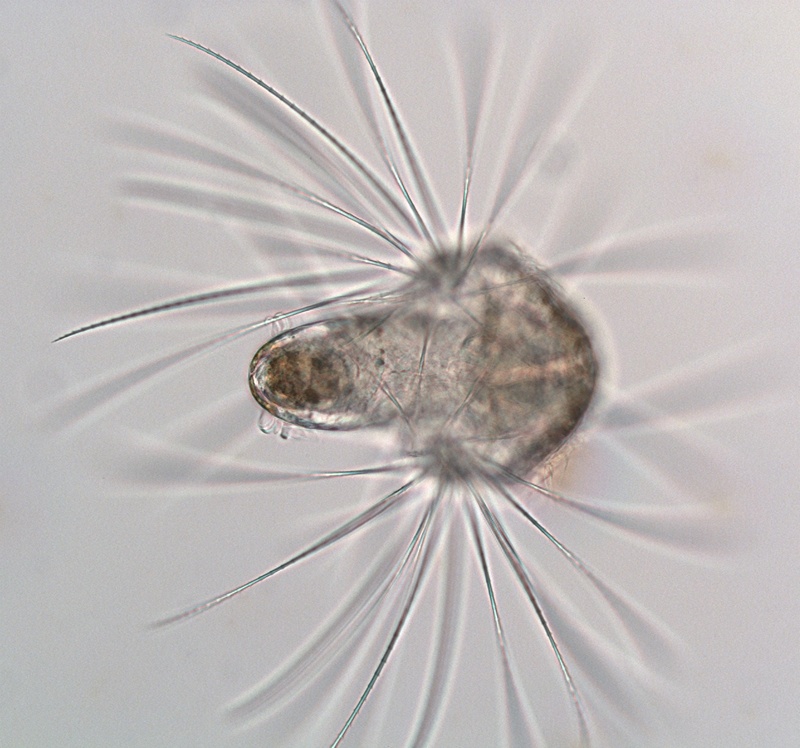 They are held close to the body when the larva is swimming (see another post by Kristina Sawyer), but can be fanned out when the larva stops moving. 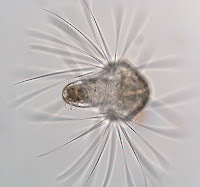 In 1984 J. Timothy Pennington and Fu-Shiang Chia observed Sabellaria cementarium larvae using their setae to prevent recognition and capture by predators, such as ctenophores (comb jellies). The barbed setae also might irritate the oral tissues of the predator and act as a deterrent. At the posterior end there is another ciliated band, which assist in swimming called the telotroch.